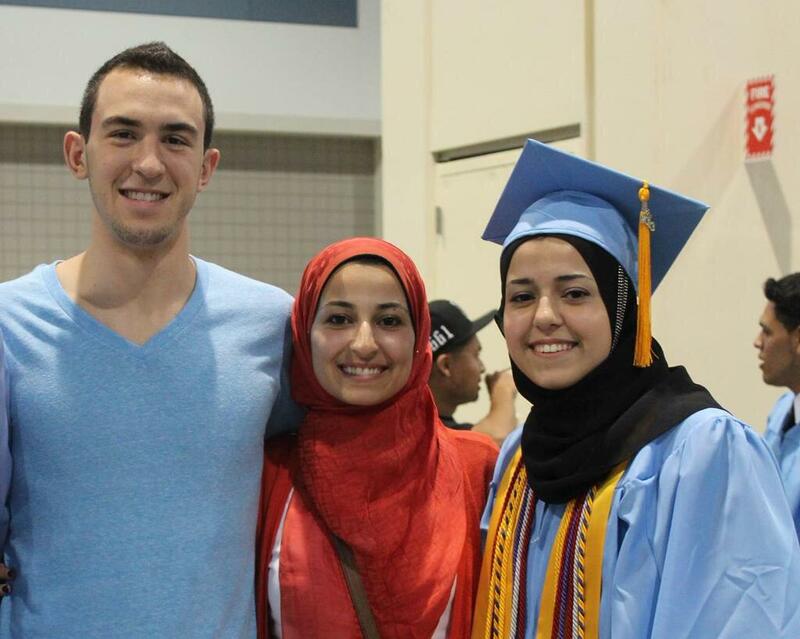 Why aren’t more people, namely those in media, talking about the outrageous murders at Chapel Hill in North Carolina, where three Muslim American students — Deah Barakat, 23, Yusor Mohammad, 21, and Mohammad’s sister Razan Mohammad Abu-Salha — were killed? I name them because it’s incredibly important that we learn their names and not just refer to them as statistics or toe-tagged bodies, and it’s even more important that we identify these “statistics” as humans, as once-living members of society so that we may somehow, some way, find compassion for these lives that were lost in a senseless act of hate. Why aren’t we more outraged? Why isn’t the media outraged at all? The local community of Chapel Hill broke the story, not a major news organization. The only reason people knew about this at all was due to viral media sites like Twitter. If this were three white students, this would have been met with national news coverage, where glorified gossip-news hybrid morning shows like Good Morning America or The Today Show would invite the parents, extended family, and friends of each slain student on to talk about how hate should be curbed and how gifted their white middle class children were at piano and student government, and Katy Perry would be invited to sing a stripped down version of “Teenage Dream” at a fundraiser to support these families. So why is there such a great lack of coverage? Journalist Melissa Tabeek, who is currently living in Lebanon, responded to this news with the following: “A dental school student who was raising money for Syrian refugees. A young couple recently married. A family killed. Can you imagine the coverage if they were white, Christian (or followers of any other religion or non-religion that is not Islam) university students?” But in a world where we glorify a film like American Sniper, which puts a ruthless, racist killer on a pedestal and white washes the horrors of war, none of this is surprising. 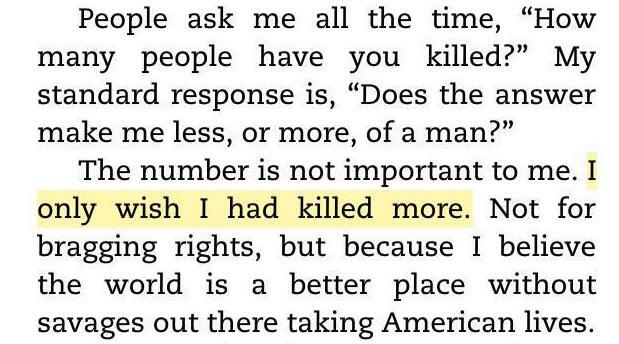 In a world where “war hero” Chris Kyle can write a book and say “I only wished I had killed more” — clearly implying arabs — and said that it was “fun,” the lack of coverage is not surprising. But it should be. This shouldn’t be a part of our discourse. We shouldn’t hate a culture or religious or race because one extremist group enacted acts of horrible terror. It’s all a part of the narrative we’ve created post-9/11. Muslim Americans, Arab Americans, are our enemies, and thus are less than everyone else somehow and don’t belong and therefore don’t deserve the same media coverage as everyone else? The reality is that we have a compulsive need to lump everyone into a box, to exist in a reality and mentality of “black” or “white,” when really we ourselves exist in a spectrum of grey; reality is not black and white, good and bad, Muslim and Christian, gay and straight; we all coexist together and create a tapestry of untapped richness. Or maybe that’s just an idealistic view of the world, especially in America, whose beliefs and practices, as a country, are still very much rooted and driven by religion and racism. 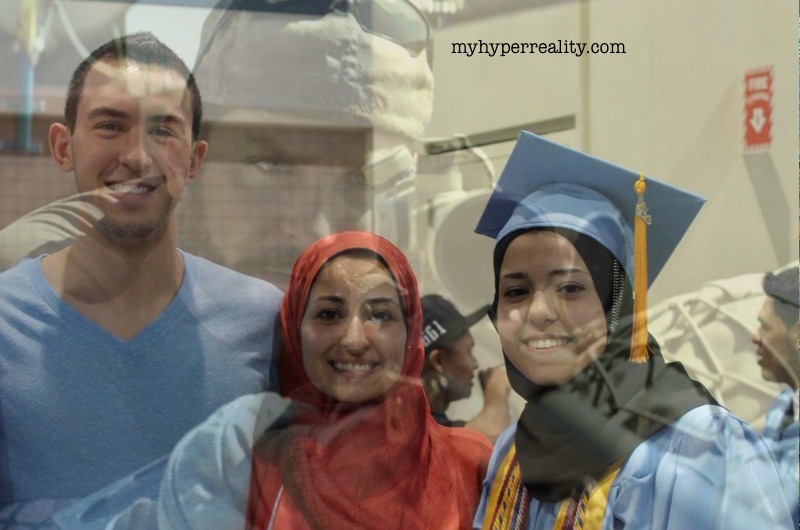 How many Americans actually think about the racist implications behind the lack of media coverage of the Chapel Hill murders, or the problem with bolstering a film like American Sniper as an accurate portrayal of a virtuous man instead of an exposé into the mind of a racist who just enjoyed killing Arabs and Muslims? This mentality creates an extremely unhealthy attitude toward Arabs and Muslims, and lends itself to an incorrect discourse about the Muslim religion and an entire race of people. This unspoken form of racism that exists needs to be eradicated. I’m a white man. Some might call me privileged because of that fact. I would call me privileged because of that fact. Like most Americans, I felt personally attacked after 9/11. Hindsight is 20/20, and I realize now, nearly 14 years later, why I felt so attacked: During my lifetime, this was the only instance where another country or culture had been able to successfully instill fear into the entire country by mass killing innocent Americans. It was scary because America is the “land of the free, home of the brave,” and my History courses in high school were teaching me that while we’d been involved in numerous wars, only during World War II was there an attack on American soil; for all intents-and-purposes, we were a solid fortress of a country. I suspect this has been a contributing factor as to why so many Americans in general feel privileged: Because [we] are. 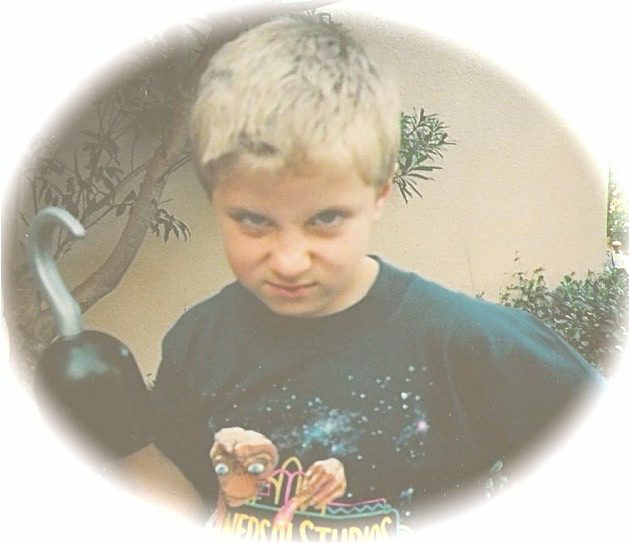 And like so many Americans post-9/11, I was “angry.” Looking back, however, I’m not sure what — or who — I was angry at, or with. From the horrific attacks on the Twin Towers and the Pentagon, and the scar it left on America, the media conditioned us to believe that all Arab American’s were the enemy by creating a post-9/11 narrative of Muslim Americans. One where killing is not just necessary, but it’s celebrated. And killing is a necessary component — or byproduct, depending on your outlook — of war, no doubt. But how far does that extend? In post-9/11 America, it overstayed its welcome, and I assume that is so because we were attacked on our own soil, so the wounds were personal and exposed an unknown vulnerability. This, unfortunately, created an open forum to hate anybody who was Muslim American, Arab American, or of Middle Eastern descent, much the same way that we developed an immediate distrust of Japanese Americans post-Pearl Harbor. This mentality created fear. Fear begets hatred. Hatred leads to a stifling of acceptance, tolerance, and an inability to process right from wrong. It also creates a sense of insecurity. 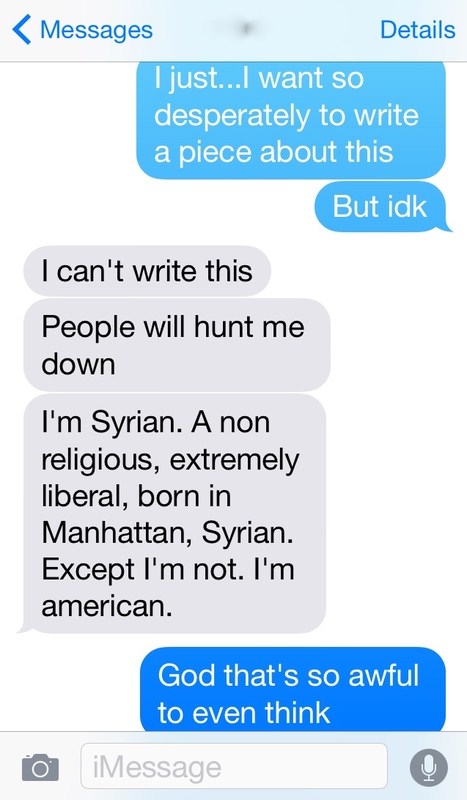 Americans, regardless of race, religion, etc., shouldn’t feel like they’re being hunted. This is the discourse that’s been created. Fear. Hate. Bigotry. The trivialization of human lives has become commonplace. This is the mentality that has been acceptable. This, and the notion that, in a time of war, all bets are off, including the lives of innocent people whose only “crime” was practicing a religion that differs from what has been deemed “acceptable,” is the new normal. It’s never OK to kill. It’s never ok for a film to twist our perceptions of reality. It’s never ok for the media to not give proper coverage to a story that would have received major coverage had it involved white victims. It’s never ok to let bias infiltrate our news. It’s never ok to feel conditioned that “it’s ok if a Muslim American died because they were probably terrorists anyway.” It’s never ok to be desensitized to all of the injustice. It’s never ok. This is what the media does. This is why it’s important to fight for better media, for more equal representation. For Deah Barakat, Yusor Mohammad, and Razan Mohammad Abu-Salhawere. For every Arab or Muslim American who feels victimized by the lack of coverage. For every American who feels threatened because of this “American Sniper Mentality,” this lack of knowledge, of basic human decency. We need to fight the real enemy: hate and intolerance. Because when it comes down to it, hate and intolerance are the roots of every single war, every single religious struggle, and the basis of every type of segregation in human history. We need to raise awareness if we’re ever going to survive. I could talk about this all day with you. I’m just so tired and angry with all the hate and bigotry in this world. I try to think about what we can do about it, and it starts with people like you, writing a blog. People exposing themselves to diversity and learning the people’s names of the ones you fear. We can’t change a lot of people, but we can help others see a different perspective, so thank you for putting your voice out there, Steven! Even with all of this hate, especially in a place such as Lebanon where so often entire identities and belief sets start and end with who and what you worship, I have hope when I think of all the people trying to change things. Like the man who, with a couple of friends, started public libraries in Beirut. The hate and bigotry is exhausting, but not just that, it’s wholly unecessary. Most of these senseless acts of violence or protests by people (whether it’s white conservatives or white media or hate groups) against this group or that group are going against their core religious base, which says that only one person/being can pass judgement and condemnation. So really, all these religious wars are giant HYPOCRITICAL ACTS. It’s ironic, really. But, like you said, it’s impossible to change the minds of everyone…but I felt compelled to write about this if for no other reason than to maybe reach one or two people and get them to think about how unfair and unequal all of the racism and hatred and bigotry is. I absolutely agree with you, and I admire you SO much for being in a place like Lebanon and reporting on social and civic change and important stories that need to be told. You’re right: it’s all about education and public space. We have to share our stories, our opinions, our lives with the world. That’s the only way we can possibly [continue to] grow. Otherwise we’ll remain just as stifled as we’ve shown ourselves to be. Nice to know it’s being shared a little bit. I don’t have a definitive reason for why the media doesn’t accurately report on important racial issues other than this: we live in a white patriarchal society governed primarily by old, rich white men who dictate what’s newsworthy in a society where we villainize Muslim or Arab Americans because of an attack on our soil and it doesn’t matter whether or not they’re extremists, we very much exist in a black-and-white society that labels and boxes people in and so we’ve lumped all Muslim and Arab Americans into the terrorist category. Same as we lump black americans into the “thug” category and label anyone who is of hispanic origin an “illegal immigrant.” It’s a gross misrepresentation, but it’s what we’re comfortable with and it’s how we’ve been conditioned. Netherlands second purchasing azithromycin online confirmed, of a archival site. http://azithrom.tumblr.com/ Pay By Check Only. how to get azithromycin without.